One aim of developmental biology is to learn how a healthy body arises from the genetic material of an organism, also known as a genome. Another goal is to understand why development sometimes goes wrong. Mutations may produce organisms with harmless—or potentially beneficial—characteristics such as extra fingers. Other times they can lead to fatal developmental defects, or problems that make it impossible for someone to lead a healthy life. They are also the reason that new species can arise. Over the past few years, research has drawn together development, medicine, and several other branches of biology in a new way of thinking about organisms that many people are still not familiar with. 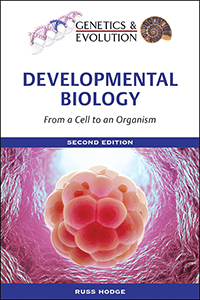 Aimed at high school students and nonscientists interested in this timely topic, Developmental Biology, Second Edition is a guided tour of humankind's embryological journey. It examines not only the embryo but also the triumphs and tribulations of biologists—from the earliest history of embryology to the latest theories in this fascinating field. Bringing readers up to date with current research on the topic, this volume explores everything from stem cell regeneration to developmental mechanisms across evolutionary time scales. Russ Hodge is a writer and science education expert at the Max Delbrück Center for Molecular Medicine (MDC) in Berlin, Germany, one of the world's leading biology institutes, where he writes books about science for the public and develops new teaching materials for high school students. He has written hundreds of articles for the press, including published interviews with world-renowned scientists such as Nobel Prize winners James Watson, Max Perutz, Roald Hoffmann, and Christiane Nüsslein-Volhard, as well as Stephen Jay Gould, Luigi Luca Cavalli-Sforza, Stephen Rose, Philip Campbell, and Harold Varmus.